Also in 2016, Star Warz will keep profiling itself as one of the finest Drum ‘n’ Bass concepts the world has ever seen. Star Warz has been visited by all leading and uprising artists & labels in the scene and it is one of the partners of Tomorrowland since day one. Some of the many extra ordinary editions include: all Metalheadz nights, 20 Years Of Ram records, 15 Years of Virus Recordings & Soul:ution, 10 Years of Exit Records, 10 Years of Shogun Audio, 15 Years of Dispatch Recordings and the list goes on. Each of them memorable nights that will go down in the history books of Drum ’n’ Bass. For this first edition of 2016 Critical Music is back for more of that special Drum ‘n’ Bass vibe Star Warz represents. Conceived by Drum ‘n’ Bass visionary Kasra back in 2002, in a front room in north London, the Critical Music name has since blossomed into one of the most successful independent record labels in the UK today. Grown from a simple idea driven by a commitment to putting out the best music the scene has to offer, it has become one of the most well respected electronic dance music labels in the UK. Nurturing new talent and releasing some of the freshest breaks and beats from the likes of Enei, Foreign Concept, Break, Rockwell, Sabre, Stray, Cyantific, Marcus Intalex, S.P.Y, Calibre, Total Science and many more, it has gone on to build a loyal following around the world driven on by Kasra’s never ending quest to release quality underground bass music. Not only a record label, the Critical empire also boasts its own highly esteemed club nights with a residency at London’s world-renowned Fabric club, as well as regular branded Critical tour nights across the UK and abroad. Drawing in familiar faces from the world of Drum ‘n’ Bass you can be sure each and every Critical event is programmed to perfection, with leagues of fans attending each one in abundance. And that will be no different on this one as Kasra is bringing some of his finest talents to the Vooruit on March 5th. Kasra secured Mefjus as a fully fledged member of the Critical Music squad in 2013 after several great releases on Bad Taste, Disturbed, Trust in Music, Citrus, Tilt, Mindtech, Ammunition Recordings & Neosignal. He first got signed with a collaboration with Enei, followed by one with the label-boss himself before two solo productions: ‘The Contemporary’ and ‘Hello World’ EP’s. His debut album ‘Emulation’ subsequently won the Drum&Bass Arena’s ‘Album Of The Year 2015’ title which means the future’s looking extremely good for this extraordinary young producer. Mefjus is now also a regular guest at Critical events all over the world and we’re very happy to welcome him on Star Warz again after an outstanding performance in 2014. Ivy Lab was born in 2011 as a meeting of the minds of Sabre, Stray and Halogenix. Initially starting off as 3 mates making beats, what was realized fairly early on was that there was potential for a lot more. ‘Oblique’ firmly set the path for cementing the coalition which immediately attracted the support of some of the highest celebrated labels and DJs of the moment. Early 2014 saw their first cemented release as Ivy Lab with ‘Missing Persons‘ – a super solid fusion of liquid, rolling beats and hip hop crossover which put it simply worked a treat! Followed again last year with another sterling EP ‘Twenty Questions‘ – their most ambitious and most accomplished EP yet. One of the new breed of uber-talented producers currently making waves within the Drum ‘n’ Bass community is Emperor. Having proved himself with some heavyweight releases on Symmetry, Titan, Ammunition and some exquisite dubstep gems on the Caliber label, Emperor affiliated himself with scene stalwart Kasra and the Critical family in 2013. Ever since, his popularity as well as his production technique has gone from strength to strength. His first EP entitled ‘Begin’ tore holes in dance floors across the underground scene. Mid 2014 saw him team up with the mighty power of Mefjus and together they produced a 4 track belter of an EP ‘Hello World‘, gaining support from all major players. 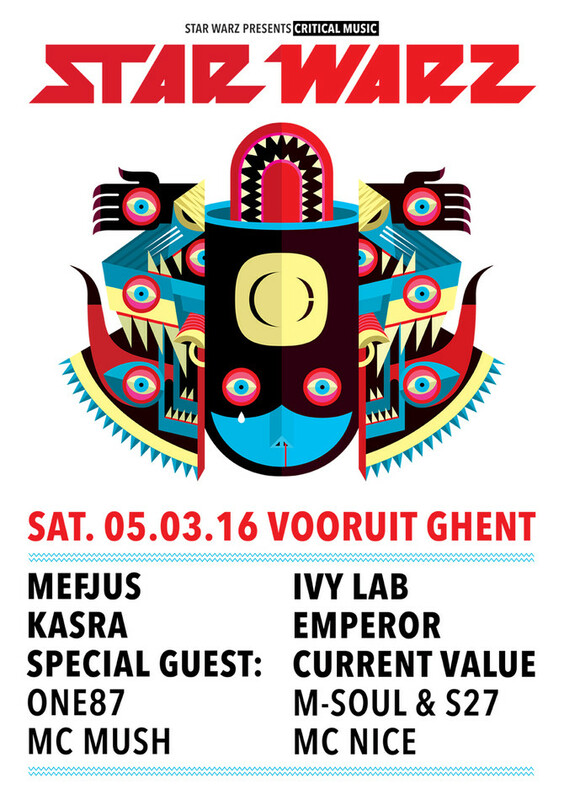 This will be his first visit to Ghent and we’re truly looking forward to it! Critical is also bringing a special guest in the form of Current Value who has no less than 8 full albums to his name. His sound is defined by a unique combination of Neurofunk, Techno and Drum ‘n’ Bass. 2015 brought him back to the forefront of the Drum ‘n’ Bass scene with focused, minimal but weighty NeuroTech productions hitting some of the largest labels in the world. This started with his ‘Binary EP’ for Critical Music and followed with his incredible ‘Nitro’ EP for Black Sun Empire’s ‘Blackout NL’ label – both of which quickly became essential staples of mixes on all corners of the globe. His third release of the year, ‘Cotton Punch’ hit Noisia’s deeply well-respected ‘Invisible’ label, showcasing his dedication to an extreme pureness and depth in the quality of his sound. A true heavyweight on an already impressive line-up! And also resident One87 has been producing for Critical. He will be supporting his label-mates in that special way that’s made him one of Belgium’s leading Drum ‘n’ Bass jocks, backed up by his favorite MC Mush. More MC power comes from MC Nice and new talent in the business is represented by M-Soul & S27 who only started producing together in 2012 but already have labels such as Proximity Recordings, Flexout Audio, Halogen music, E-motion Recordings and more on their resume. Star Warz at its best, critically brutal, as usual!